The voices who can chime in on this weekend's Hall of Fame induction of Rick Pitino are many, spanning the spectrum from various levels of college basketball to the NBA. Walter McCarty has one of the more unique perspectives on Pitino. He was recruited by him and played for him at Kentucky, including on the 1996 national title team. He was also on the Boston Celtics when Pitino coached. And then worked as an assistant coach for Pitino at Louisville. "We were so well prepared for games [at Kentucky]. It's how we practiced. We always outworked everyone. He broke every detail down. I just think our preparation showed in practice every day. If we wanted to win, that's what we did. And we did it with confidence. It was the same thing as I got older and worked for him. I realized that as a coach after playing for him. That's why he has been so successful. It didn't matter who we played. It could be North Carolina or Eastern Kentucky. We prepared the same. We never overlooked anyone. I just have so much respect for the way he prepares and teaches his players. He's been great for me and a great mentor and a great friend and a great person to learn from. "In high school, he was the first coach who was honest with me. He wasn't someone who came in and said you could start. Coach P was very honest in the beginning. He said, 'I don't know how much you're going to play or if you can play. But you'll need to work hard every day. You have a chance to be a really good player.' He was the first coach who I really trusted and really believed in. I trusted him early on. He was honest. He didn't blow smoke on me. He respected me as a player. He also was allowing me to come in and be me. I had to gain weight. I had to weigh in every day just to be able to start. It was tough but he knew I could get stronger. He was honest and I appreciated that. He was a great person for us and was always there if we ever needed him. He was a father to us all. "Off the court, we had fun. On the court, it was not. For two-and-a-half hours Coach P kicked our butts. It was tough. We could see significant change as to how we were getting better. We trusted everything coach said. We ate it up. We put the hours in and soaked up all the knowledge. We had an awesome experience. I loved playing for him. "In the pros, we had some small victories. There were a lot of egos that didn't come together. I knew the vision coach had and I knew what we had. Antoine [Walker] understood what his style was, but other people who had been in the NBA didn't get it. They didn't know. If coach got on you or screamed at you, two minutes later he had forgotten about it. We didn't sit there and sulk. A lot of players couldn't take that. I think it rubbed players the wrong way. They didn't want to be confronted and didn't want him to embarrass them. He had so much success at Kentucky and he wanted the same success at Boston. I think he was a little impatient. He wanted success so badly, but it just didn't happen that way. The players didn't have the patience. He never got certainty of who was in and out. It was unfortunate. I definitely think he did good work in the pros but it was a bad formula and a bad group at the time. "Working for him, well, we had already trusted each other and become good friends. But we had never spent a lot of time together like that. We watched tape together, recruited and spent a lot of time together. I had always been a player, then I was in the office all the time. We were driving together. We spent a lot of time together and got to know each other more. It was at a deeper level. We became friends, not just as a coach friend. I saw a different side of Coach P. We became really close and I got to know him on that level. I learned so much. I would always pick his brain about recruiting and coaching and why he was doing this or doing that in a way. "I wanted to know how creates the magic. I wanted to know everything. I just really appreciate it. It was just awesome. I saw him as a human being. I saw him enjoying life instead of being a drill sergeant. "I definitely wouldn't be coaching without him. If I didn't go to Kentucky, I don't think I would have learned how to prepare and work hard. Everything I learned, I learned from him. I know I wouldn't be sitting here where I am now if it weren't for him. He worked so hard for our dreams to come through to be professional basketball players and to provide for our family. If it weren't for him, I doubt I would be nearly as successful as I am today. "He told us want to do with our money, he gave us more than just tools for basketball. He gave us tools to be successful in the world. No other coach out there has done as much for his players, not just the star players, but anybody who played for him. You could be the 15th player on the team, but if you played for Coach P, he made sure you got it. He was around for life. "Probably beside my parents, he has affected my life as much as anybody. I played for my dad and he had an impact, but it's amazing how much I learned from him and continue to do so. If I'm ever to be able to become a head coach, I'm sure 90 percent will be based on what I learned from him as a player. You don't realize how much you learn while you're there, even off the court. But he had a big impact over the four years I was there. "From what I have heard, coach has calmed down. But one thing that hasn't changed is the competitiveness and desire to win and succeed. He's really enjoyed where he is right now and success he's had. I was there early on in his tenure at Louisville. We had some pretty good success but the last couple of years I think he's enjoying where he is and he's comfortable. He wants to finish there and be a Cardinal for the rest of his career. He's really in a happy place. "I don't know if I could put into words what he has meant to basketball. He's one of the only coaches to win a national title at two different schools and the impressive stat is taking three different schools to the Final Four. It's hard enough to take one school. The impact he's had on so many players from Walter McCarty to Billy Donovan. Over 30 years, he has impacted so many people's lives on and off the court. It speaks volumes how successful his former assistants have been as head coaches. His coaching tree extends really, really far. "I spent a year after playing overseas at Louisville as a grad assistant. It was like a trial run. It was good to spend a year to see how the other side works. I ended up really enjoying it. I was fortunate to get the job here. But when I need advice I can call him. He has had a huge impact on me. How much? It's immeasurable, just from a resource standpoint. He can pick up and get someone a job and help. If you ever need advice. To have Rick Pitino atop the resume is pretty impressive and I know he would do anything in the world for me and I would for him. I'm fortunate to be a part of his life. Editor's Note: For more reflections on Rick Pitino's career, read our full coverage in the Nation blog. The FIBA U-19 World Championships may not resonate here at home, but the goal of winning gold has never been more explicit within USA basketball. As the seriousness of the men's national team has taken on a new level in the last eight years, the junior national team has followed that example. Coaches are returning. Players are, too. Suddenly, playing for Team USA has value -- as it should. But this is not an all-star team. This is a team that will compete in Prague next week, crafted to fit Florida's Billy Donovan's coaching style. He wanted a team that could press, rebound, defend and generate turnovers. The havoc fits the way one of his assistants -- VCU's Shaka Smart -- loves to coach. Here is the final 12-man roster and Donovan's assessment of what they've done and can do for Team USA, which begins play in the Czech Republic on June 27. The gold-medal game is set for July 7. 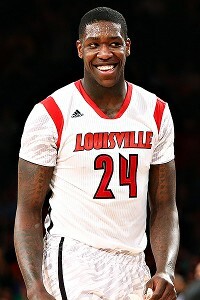 Debby Wong/USA TODAY Sports Montrezl Harrell will have an increased role at Louisville this season and his experience with Team USA should help.